For a while, we’ve seen other bloggers talk about why they write income reports, so we thought we’d share why we do it too. Income reports were a part of our success in blogging from anywhere. They were a place where bloggers opened up about how they made their income and the steps they took to get where they were today. So instead of just keeping their success to themselves, they laid it out for newer (and not so new) bloggers. And we wanted to do that too! Now onto December’s income report! Now this month’s pageviews were still suffering slightly due to a possible algorithm change and the Thanksgiving week (because unless you’re a food blogger with great recipes or holiday DIY’s, your views will probably go down). However, it did go up a lot towards the end because of everybody being off for the holidays. Last month’s income went up.. a ton! November’s total income was $11,134.33, so as you can imagine I’m pretty excited. 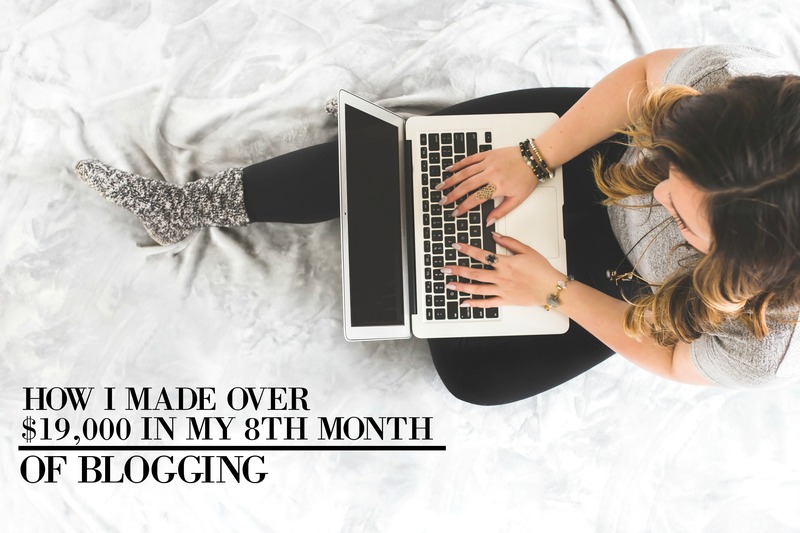 I mean I’ve heard of people reaching $10,000 in a year, but after blogging for only 8 months.. it’s kinda crazy (see how leaving the 9-5 is weird in a strangely awesome way?). Like going from making basically couch change to almost $20k a month has made my husband and me very thankful and excited that we get to do more things with our lives and actually help others. For months I was with Google Adsense as an ad server, and I am so glad that I switched over to Mediavine. It’s so good to go from 80 cents RPM (how much I get for every 1,000 views) to around $10 RPM. I feel like I’m actually being paid for how much hard work I put into this blog. Mediavine is a great option for an ad server and accepts anyone who has over 50,000 views per month. So once you hit that magical pageview mark, sign up for them as fast as you can! Affiliate income went up quite a bit last month. I blame this on Michelle’s course, Making Sense of Affiliate Marketing. It’s always great to keep on learning, even when you feel like you have a lot figured out. Because when you put money into your blog/business (in this case, taking online courses), you’ll get even more than what you paid for it back. December was crazy for income, but it’s almost ironic. Because of big moves and transitions and the holidays all wrapped up together (no pun intended), I wasn’t able to produce as much content as I wanted. So my work decreased while my income increased. It just goes to show that even on the down months (for work), you can still get great money because of the hard work you’ve put into previous months. And the answer is yes. That hard earned money that you set aside to pay for hosting (or another part of blogging) will be paid back to you multiple times over if you decide to invest in it now. Alright, now you’re probably wondering, “So HOW do I save up for it Grace? C’mon! Get to it!” Ok ok! Sorry! Here’s what my husband and I had to do. Each paycheck, we would put back a certain amount to pay for hosting (or another part of the blog). It didn’t matter how small of an amount it would be (ex. $10 or $20), we would just put something back. And finally we would have the amount we needed to pay for a certain part of the blog. We also made sacrifices as well, such as not eating out, not getting new clothing, not buying things we didn’t really need. Seriously guys, during the time we started the blog, I had lost some weight (on purpose, don’t worry), and all of my pants didn’t fit me anymore. I was a couple sizes too small for them now but I refused to buy new pants just so we could make ends meet and have me work at home without having to look for a job. It was tough, but of course I’m so glad I did it. I promise you, you can do this. Let me know which one you want answered for next month’s income report! 2. How do I find the best group boards on Pinterest to join? 3. What if the niche I want to do is already done by so many other bloggers? How will I get people to see my blog and even take an interest in it? I still have a question: did you sign up for Google Adsense from day one (since you have a lot of content when you launched your blog) ? Yes, we signed up for Google AdSense right away. I’d love to hear more about Group Boards on Pinterest. I LOVE Pinterest but feel a little awkward asking to join group boards- especially since I haven’t launched my blog yet. More info/advice would be greatly appreciated!! God, you’re really inspiring me! I’ve had my hobby blog for quite a long time but never really took it serious. However, this year I’ve made the decision that I’m going to stick with it and give it all I’ve got. Thank you for the great tips especially the one about making multiple images for each post. My one question is that when do you post these images on group boards? Do you post all multiple images or just some to each group board? Hey Hana! I’m so glad I could help and inspire you! As for the pins, I only pin the images once to different boards. I hope this helps you! I just want to say that I have followed this blog since around June of last year. I’m proud of how far the both of you have come along with your blogging journey! I’m beginning a blog also, but I’m just having issues coming up with blog topics. What do you guys do when it comes to your blog posts? Hey Brittany! I’m so glad I could provide you with inspiration! As for blog posts, I look at what other people in my niche are writing about and then ideas stem from there (that’s the easiest solution!). Rosemarie was your inspiration, but you are mine! Thank you! I started my blog 8 weeks ago and I very hopeful about living of blogging income soon (Sorry for my english I’m still learning). I would like to know about the first one (1). when a person has a full time job for next months question. Thank you. Hey Sue, I would recommend to work at stockpiling as many posts as you can in your off hours to make it so that you can have a better launch, quicker. This way you can grow your blog faster by creating more content and adding more value up front. I’d recommend finding any time you can – break time, lunches, nights and weekends. Whenever makes sense for you and your schedule. Hi Silas & Grace!! I have been following your blog for a couple of months now and it has been so inspiring. I just moved back to my home town and I have been praying about starting a blog to help support me so I can do ministry and missions. Hoping to launch in a month or two…. It’s hard for me to choose between ” How do I find the best group boards on Pinterest to join?” and “What if the niche I want to do is already done by so many other bloggers? How will I get people to see my blog and even take an interest in it?” Those are two areas I would really like to learn about. 🙂 Thanks again and I can’t wait to see how God blesses your blog in the coming months. Hey Melissa! Great to hear about your ministries. About your first question – How Pinterest Became My Full-Time Job is a post we have that covers that. We’ll be writing another post shortly that goes into even more depth on the topic. About your second question – its alright if other people are already writing about what you’re going to write about – it means people are interested. When we started our blog there were other people writing about travel, money, lifestyle, relationships and the like. What you need to do is figure out a way to provide value in a unique way. This will make people want to keep coming back for more. Your post always inspired me! everytime I’m feeling stress with the blog, I always reading your blog and it really helps a lot. Recently I just got a job and what I need your advice how to keep the blog running and what tools to help me to post on pinterest. thanks a bunch! Hi Grace! My name is Kathryn and I’m very interested in starting a blog. I’ve read some of your more recent blog posts about starting a blog and I’m currently in the process of trying to create blog posts, like you have suggested. I have so many questions but I would primarily like to know about your question of the month #3. I feel like everything I’d like to write about has already been written about a thousand times over and I’m worried 1. that no-one will take any interest and 2. that I will inadvertently plagiarize someone. If you could offer any advice I would greatly appreciate it! Thank you! I’ll answer your questions as you’ve numbered them. Its alright if someone else has already done the same type of blog, you just need need to find a different type of way to add value that this specific niche is missing. We started writing about things like travel, lifestyle and making money online these areas already had thousands of blogs and other sites devoted to them – but we were able to find a way to make a niche and get ourselves out there and now we’re having a conversation with you. If we can do it, you can too! As long as you’re creating unique content, you’re not plagiarizing. If you borrow from someone else’s work then you can link and cite the work you’ve done and that will keep you covered there while making sure that you’re giving that person the credit that she’s due. Hi! Just found your blog! You mentioned abc and d testing for pictures for a post. How do you find out which picture will do better? Do you put all the pictures with the different titles in a post? Thanks! I just found your blog today and what a great surprise it is! Your blog has really inspired me to want to start a blog myself, in fact, I’ve already registered with EBA, and I’m now seriously considering how I’m going to start right away. I’m sure will be reading all your blogs first about this, so thank you so very much! I am so excited right now, but I also feel like I don’t know where to begin. I’m definite not one of those tech-savvy types at all, so your second question “How do I find the best group boards on Pinterest to join?” is very crucial to me. I’d be grateful if you could answer that. Once again, thank you for putting yourselves out there for us beginners. Hey y’all! New to the site! I have a question about your abc/d testing for pictures on Pinterest. Do you put all the pictures in your post? Or just upload pictures from your computer with a link attached. Can you talk about that process? Thanks!! Thank you for posting this, this is the best one I have seen! Very detailed and love the step by step! I can’t wait to see where else you go and how much you also continue to grow! Thank you! Did you switch from google adsense to mediavine? And do you like mediavine better? I looked at their website and it says that if you sign up with them, you can’t have anyone else (probably meaning google adsense). Do you still use mediavine? And why? Hey Shelly! Yep, we switched over to Mediavine and haven’t looked back. They pay us so much more than Google every did and they’re very helpful and friendly (as apposed to Google Adsense where you can’t really get a hold of them if there’s a problem). Hi there! So inspiring to see your success. When are you going to post your February income report? Curious to see how things are going post-holidays. How do you get away with having so many Google ads on each page? I thought the limit was 3 per page. On some of yours you have them under each image and as many as 12 that I’ve seen. How is this possible without violating Googles TOS?